Teresita Leonardo-De Castro has taken her oath as the country's new chief justice. The newly-appointed chief magistrate, who occupies the former seat of the ousted Maria Lourdes Sereno, took her oath before the Supreme Court en banc at 10:30 a.m. on Tuesday, Associate Justice Antonio Carpio confirmed, according to a report on News To Go. She is now presiding over the en banc session, a court insider said. 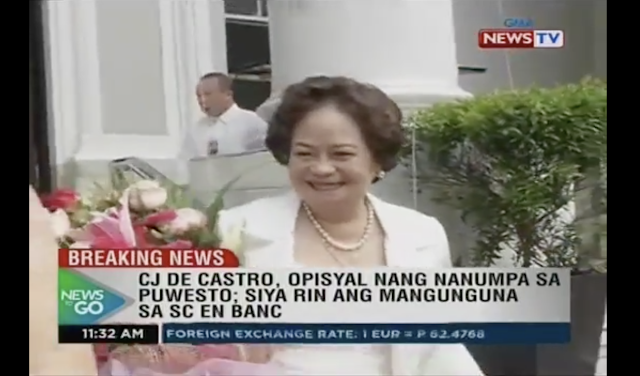 De Castro was welcomed by applause and flowers from court staff earlier in the day. She is the first female Philippine chief justice, after Sereno was found to be "de facto" officer who is ineligible to hold the same position "for lack of a constitutional qualification." President Rodrigo Duterte appointed De Castro as the new chief justice last week.